Talented forward duo Neymar and Oscar took centre stage as Brazil warmed up for their latest World Cup qualifier. 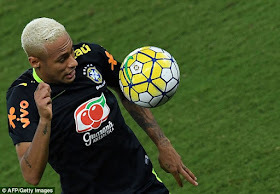 Brazil face Bolivia on Friday as they look to build on their current second place in the South American group. The five-time World Cup winners have drawn three and lost one of their eight games. 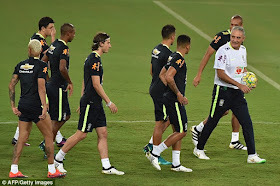 The Barcelona star was part of the Brazil squad who trained at the Arena das Dunas in Natal on Tuesday, Neymar embracing Chelsea's Oscar in a passionate hug before the players got down to work.